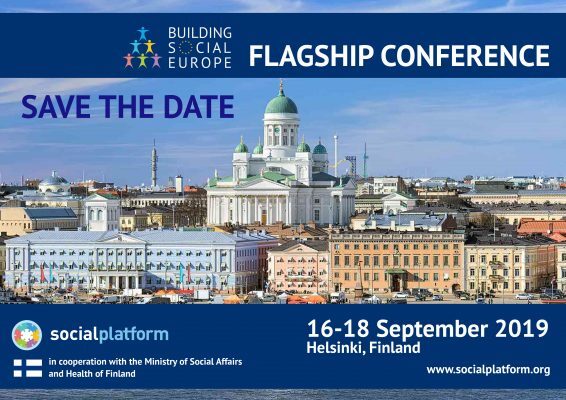 2019 “Building Social Europe” conference will take place in Helsinki, Finland on 16-18 September. The second Flagship Conference will take place during a very crucial time: European leaders will be preparing the next EU legislature following the European elections results, negotiating, nominating and electing the future European Commission and filling in EU top jobs. All this will be taking place against the backdrop of growing popular mobilisation for greater social justice and democracy, stopping and reversing an environmental crisis and securing the future for the next generations. As civil society organisations active in the social sector, we will take a leading role in that debate and we will take our responsibility to make sure that the common good prevails over the interest of a few. 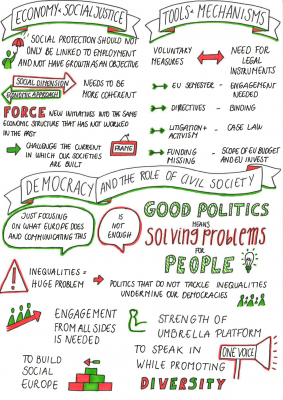 Our Flagship Conference will be an opportunity for our members and actors from a wider European social movement to debate with national and EU level decision-makers on how the European Union can prevent further decay in social justice, democracy and trust in the EU. 1. Social justice: How to make the economy work for people? 2. Participatory democracy: How can civil society become the missing link between people and decision-makers? This year’s Conference is organised in cooperation with the Ministry of Social Affairs and Health of Finland. The Conference will take place back to back with the Finnish EU High Level Presidency’s Conference on the Economy of Wellbeing. This topic is a priority of the Finnish Presidency with the aim of adopting Council Conclusions. A delegation from Social Platform will attend the Presidency conference and High level speakers of the Finnish Conference will participate in our Flagship event. We are very grateful to SOSTE – Finnish Federation for Social Affairs and Health who provides enormous support in organising our Flagship Conference. The first Flagship Conference took place in November 2018 in Lisbon, Portugal and was organised in cooperation with the Portuguese Ministry of Labour, Solidarity and Social Security. The 2018 Flagship Conference primarily marked the first anniversary of the proclamation of the European Pillar of Social Rights, evaluated its implementation and identified actions needed for a meaningful implementation of the Pillar. More on our first Flagship Conference below. On 29-30 November 2018, Social Platform in cooperation with Portuguese Ministry of Labour, Solidarity and Social Security, organised its very first Flagship Conference “Building Social Europe”. The aim of the conference was two-fold. Firstly, we marked the 1st anniversary of the proclamation of the European Pillar of Social Rights which EU leaders adopted in 2017 at a high profile Social Summit and which we supported and advocated for. We wanted to have initial evaluation and most importantly, we discussed how that political commitment and proclaimed Pillar are translated into effective and meaningful implementation. Secondly, we wanted to ensure that the decision making process on social issues fully include and involve civil society organisations. As one of our platform members puts it: “Nothing about us without us!” We believe that a truly strong, sustainable, socially and economically just Europe is only possible when people and their well-being are the core of the debate and civil society is part of that debate and decision making. Short brief about the conference. Video prepared for the conference in which Social Platform members share their views on the European Pillar of Social Rights. 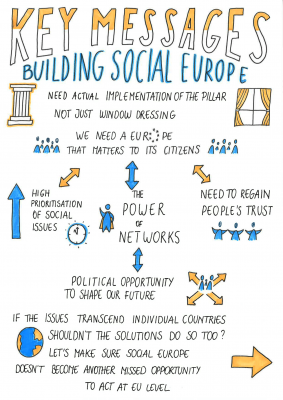 Building Social Europe – An Urgent Call to Action for all EU institutions, Heads of State and Government, and relevant ministries of EU Member States – adopted by Social Platform members on on 18 December 2018 following conference discussions.